Square Enix has sent out photos and info for a new Play Arts Kai figure. Check out the first photos and info for Metal Gear Solid V: The Phantom Pain – Revolver Ocelot Play Arts Kai Figure. The figure will include a number of accessories. 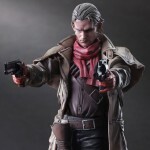 Included are a swappable head, interchangeable hands, two different revolvers and a figure stand. Ocelot is scheduled for a Japanese release in October. The figure is priced at 12,800 Yen (About $103 USD). Look for pre-orders to hit U.S. shops soon. You can check out the images after the jump.